The operator of the New England power grid (ISO New England) issued a media release yesterday noting that because of the decline in natural gas prices, overall, wholesale electricity prices in the region dropped in 2012. Reader”s” (if there is more than one) of this blog know I write a lot about energy issues and have noted the trends and benefits of natural gas to energy prices in the region (here, here, here, and here as well as in posts about other energy issues). Increased U.S. production of natural gas has resulted in price declines and price declines are resulting in more fuel switching that will put more pressure on the price of natural gas unless production increases faster than increased demand. 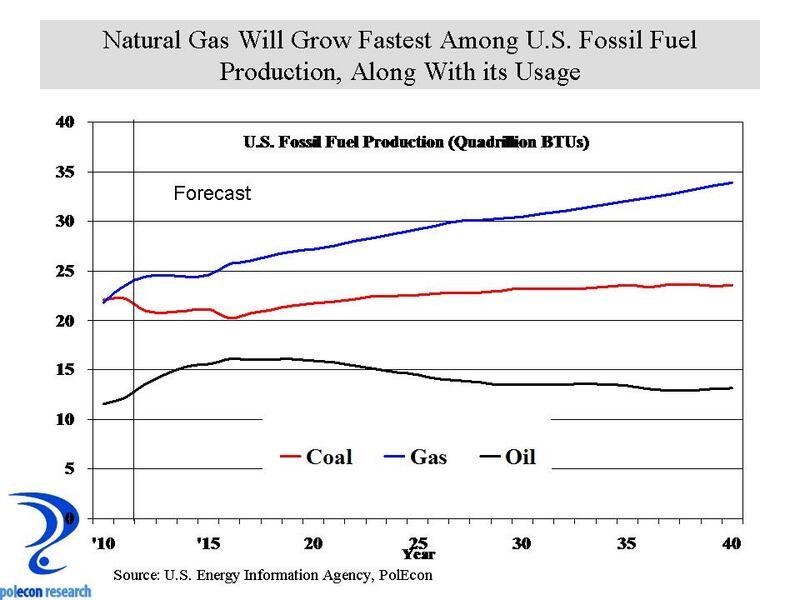 U.S. production of natural gas is likely to continue to increase faster than other fossil fuels (see chart below), but increased fuel switching will put more pressure on natural gas prices. One problem for New England is that our infrastructure for delivering natural gas to the region is the weakest of any region of the country and one result is that unless or until that changes, we won’t benefit as much as other regions from increased production. The chart below shows a forecast of real, inflation adjusted fossil fuel prices to 2040. 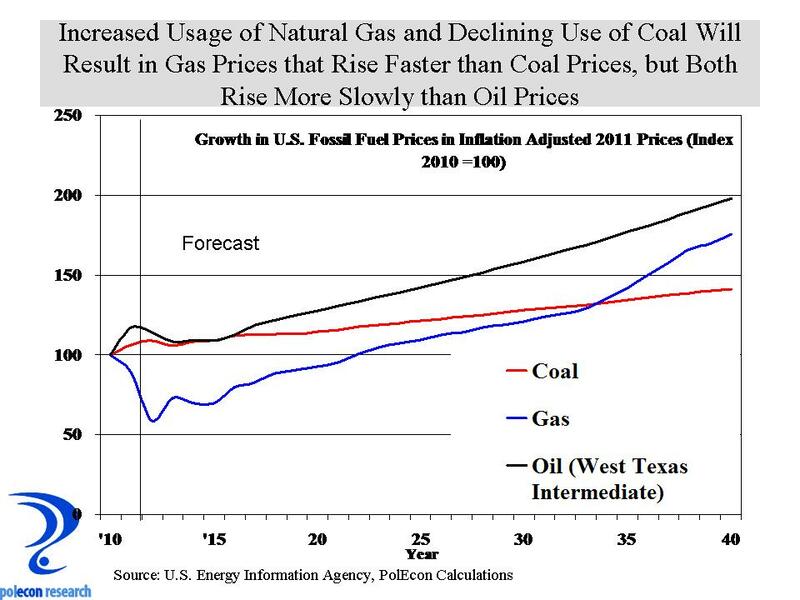 Nationally, natural gas prices will rise faster than coal, but more slowly than oil. The natural gas price trends here are for prices at Louisiana’s Henry Hub distribution point (the reference price for natural gas prices), New England prices are higher but the question is, how much faster or slower will they grow in New England? Improved infrastructure would help. Coal is abundant and prices will grow relatively more slowly, but the economics of coal as an energy source still don’t give it an advantage over gas. Over the next 3-5 years over 200 coal-fired electric generating plants will be retired according to a coal trade group. They blame environmental regulations but there is more to it than that. Besides the greatly narrowed gap in fuel costs between natural gas and coal, the fact is most people don’t want coal used, or have it used near them. The cost of burning coal more cleanly is relatively high (it’s not just regulators that impose those costs, it’s the only way a majority of the public will support coal and if it costs too much they wont support it as long as there are more competitively priced alternatives – as there are now). Finally the cost of constructing a coal plant, compared to combined-cycle natural gas power plants is much higher (even without the new equipment required to reduce emissions) and they take longer to build 4-5 years compared to 2-3 years for natural gas, making financing of such projects more difficult. I am not a coal hater. Although I have worked on many more combined-cycle natural gas electric generating plants, I have also worked on two or three electric generating projects that burn coal, most recently one involving super-critical clean coal technologies and carbon capturing, but phasing out older, less efficient, coal-fired plants makes perfect sense and can be done over time without jeopardizing the reliability of the grid if new natural-gas fired plants are built. Relying just on natural gas doesn’t solve our CO2 problem but it helps (ok deniers, let loose – I am a believer that CO2 is a problem that needs to be addressed). The point of this post (by now you are probably asking if there is one) is that fossil fuels are not going away anytime soon. Not too long ago there were apocalyptic predictions about the availability of fossil fuels in the future. Those predictions aren’t proving accurate but at some point fossil fuels will run out. Not in my lifetime, which is a good thing for my business as long as I still can get hired to work on natural gas or (gasp) coal-fired electric generating projects. But more abundant fossil fuel doesn’t (or shouldn’t) lessen environmental concerns over its usage. The stone age didn’t end because of a shortage of stones and the fossil fuel age shouldn’t wait to end until we run out of it. Somebody will have to pay for developing new technology that ends the fossil fuel age. Unless we start now, the cost of the U.S. debt that we pass down to future generations will look small compared to the costs of developing new energy technologies that we will be passing down in the face of genuine declines in fossil fuels. It is not just a matter of increasing renewable energy, although that will help. Solar and wind and even hydro generation suffer from over/under demand issues. Balancing power output to need is extremely problematic once you try to get renewable power above 20% of total generation, new technologies need to be developed. The stone age was replaced because newer and better technologies were developed despite an abundance of stones, lets hope the same is true for the fossil fuel age. This entry was posted on January 24, 2013 at 1:12 pm and is filed under coal, Electricity, Electricity Generation, Energy, Natural Gas, Oil, prices. You can subscribe via RSS 2.0 feed to this post's comments.